Lakhmir Singh & Manjit Kaur kaur Solutions for Class 10 Science Chapter 6 The Human Eye And The Colourful World are provided here with simple step-by-step explanations. These solutions for The Human Eye And The Colourful World are extremely popular among class 10 students for Science The Human Eye And The Colourful World Solutions come handy for quickly completing your homework and preparing for exams. All questions and answers from the Lakhmir Singh & Manjit Kaur kaur Book of class 10 Science Chapter 6 are provided here for you for free. You will also love the ad-free experience on Meritnation’s Lakhmir Singh & Manjit Kaur kaur Solutions. All Lakhmir Singh & Manjit Kaur kaur Solutions for class 10 Science are prepared by experts and are 100% accurate. The human eye contains a convex lens. The cornea and the lens are two parts of the eye that refract light rays. (a) which controls the amount of light entering the eye. (b) on which the image is formed. (c) which changes the focal length of eye-lens. (a) The iris is the part of the eye that controls the amount of light entering the eye. (b) The retina is the part of the eye on which images are formed. (c) The ciliary muscles change the focal length of the eye lens. (a) the curved, transparent front surface of the eye? (b) the light-sensitive layer in the eye? (a) The curved, transparent front surface of the eye is called the cornea. (b) The light-sensitive layer in the eye is the retina. The image is formed on the retina in a human eye. In the human eye, the function of the lens is to focus the light rays entering the eye from an object and form a real and inverted image of the object on the light-sensitive screen called the retina. The pupil of the eye controls the amount of light that enters the eye, with the help of the iris, which allows it to expand or contract according to the intensity of light. When there is an increase in brightness, the pupil of the eye contracts so as to allow less light into the eye. The retina is the part of the eye which is equivalent to the photographic film in a camera. The blind spot is the part of the retina which is insensitive to light. Which part of the eye contains cells which are sensitive to light? The retina is the part of the eye which contains cells that are sensitive to light. Rods and cones are the two types of cells in the retina of the eye which respond to light. The least distance for distinct vision for a normal human eye is 25 centimetres. Therefore, in order to see the printed matter in a book clearly, without straining our eyes, the book must be held at a distance of 25 centimetres from our eyes. When it is placed nearer to the eyes, the printed material in the book appears blurred and we feel strain in our eyes. (a) when the eye is focused on a near object? (b) when the eye is focused on a distant object? (a) When the eye is focussed on a nearby object, the eye lens bulges and becomes thicker. This is because, when the eye is focussed on a nearby object, the ciliary muscles of the eyes contract, loosening the suspensory ligaments attached to the the eye. As these ligaments become loose, they stop pulling the eye lens, because of which the eye lens bulges (or becomes more convex) so as to increase its converging power. (b) When the eye is focussed on a distant object, the eye lens gets stretched and becomes thinner. This is because, when the eye is focused on a distant object, the ciliary muscles are completely relaxed. The relaxed ciliary muscles pull the suspensory ligaments tightly. As these ligaments become tight, they pull the eye lens, because of which the eye lens becomes thinner (or less convex). (a) the focal length of eye-lens will be the maximum? (b) the converging power of eye-lens will be the maximum? (a) When the eyes of a person are focussed on a distant object, the focal length of the eye lens is the maximum. (b) When the eyes of a person are focussed on a nearby object, the converging power of the eye lens is the maximum. (a) When the eye is focussed on a nearby object, the ciliary muscles of the eye contract, loosening the suspensory ligaments attached to the eye. As the ligaments become loose, they stop pulling the eye lens, because of which the eye lens bulges (or becomes more convex), increasing its converging power. 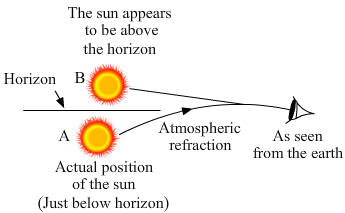 As the converging power increases, the eye lens converges the diverging rays of light from the nearby object to form its image on the retina. (b) When the eye is focussed on a distant object, the ciliary muscles are completely relaxed. The relaxed ciliary muscles pull the suspensory ligaments tightly. As the ligaments become tight, they pull the eye lens, because of which the eye lens becomes thinner (or less convex). The focal length of the eye lens is the maximum but its converging power is the minimum. However, the small converging power is enough to converge the parallel light rays from the distant object and form its image on the retina. The amount of light entering the eye is controlled by changing the radius of the pupil. The pupil changes its radius with the help of the iris, which allows it to either expand or contract according to the intensity of light. When we are in the bright sun, the pupil of the eye contracts and lets in minimum light. However, when we enter a darkened cinema hall, the pupil does not immediately dilate and we are unable to see in the low-light conditions. But, after some time, the pupil opens to allow more light into the eye and we are able to see clearly. When we enter a dimly lit room, it takes time for our pupils to expand and let in enough light for the retina to 'see' the objects around. During this time, we are not able to see the objects very clearly. (b) which work in dim light? (b) Rods work in dim light. True. The eye lens is a convex lens, so it converges the light rays from an object and produces a real and inverted (upside-down) image on the retina. The principal function of the eye lens is to focus the light from an object entering the eye and produce a real and inverted image of the object on the retina. The greatest degree of refraction of light occurs in the cornea of the eye. The ciliary muscles change the shape of the eye lens and thereby adjust its focal length to enable us to see objects that are near or far away. The ciliary muscles make the eye lens thicker so as to increase its converging power when the eye is focussing on a nearby object. The least distance for distinct vision for a normal human eye is about 25 centimetres. (a) far point of a normal human eye? (b) near point of a normal human eye? (a) The far point of a normal human eye is located at infinity. (b) The near point of a normal human eye is located 25 cm in front of the eye. The range of vision of a normal human eye is from 25 cm (near point) to infinity (far point). The ciliary muscles in our eyes help us to focus objects that are near and those that are distant in quick succession. The power of accommodation of the human eye refers to the ability of the eye to change the focal length of its lens so as to focus the light from both nearby and distant objects on the retina. (a) carries signals from an eye to the brain. (b) muscles which change the shape of the eye-lens. (c) a hole in the middle of the iris. (d) a clear window at the front of the eye. (e) changes shape to focus a picture on the retina. (e) The iris controls the amount of................entering the eye. (a) Most of the refraction of light rays entering the eye occurs at the outer surface of the cornea. (b) The part of eye sensitive to light is retina. (c) The part of eye which alters the size of the pupil is iris. (d) When light is dim, the pupil becomes large. (e) The iris controls the amount of light entering the eye. (f) The ciliary muscles control the shape of the eye lens. (g) To bring light from a distant object to a focus on the retina of the eye, the convex eye-lens needs to be made thinner. (h) To bring light from a near object to a focus on the retina of the eye, the convex eye-lens need­ to be made thicker. (a) State the effect on the pupil of the eye. (b) How does this affect the amount of light entering the eye? (a) A person can feel glare in the eyes when entering a brightly lit room from a dark corridor. This is because the pupil of the eyes are large when the person is walking in a dark corridor, and as the person enters a brightly lit room, a large amount of light enters the eyes; hence, he or she feels glare in the eyes. It takes some time for the pupil to get adjusted to the intensity of the surrounding light, and gradually, they contract. (b) As the pupil of the eyes contract, less light enters the eyes and the glare gradually decreases. This enables the person to see the surroundings more clearly. The ciliary muscles of the human eye can contract or relax the eye lens and help in changing the focal length of the eye lens. Because of this, the eyes can focus the images of nearby as well as distant objects on the retina. (a) When the eye is focussing on a distant object. In this case, the ciliary muscles are completely relaxed. The relaxed muscles tightly pull the suspensory ligaments, which in turn pull the eye lens, because of which the eye lens becomes thin. The thin eye lens has a small converging power, which is sufficient to converge the parallel light rays from the distant object to form an image on the retina. (b) When the eye is focussing on a nearby object. In this case, the ciliary muscles contract, because of which they cannot pull the suspensory ligaments tightly. As the suspensory ligaments are loose, they stop pulling the eye lens, and therefore the eye lens bulges and becomes thick. The thick eye lens has greater converging power, which helps in converging the diverging light rays from the nearby object to form an image on the retina. A normal eye can see objects situated at various distances clearly because of its power of accommodation. Power of accommodation is the ability of the eye to focus nearby as well as distant objects on the retina by changing the focal length of the eye lens. The ciliary muscles can contract or relax the eye lens and hence help in changing its focal length. (a) When the eye is focussing on a distant object, it is said to be unaccommodated. The ciliary muscles are relaxed, because of which they tightly pull the suspensory ligaments, which in turn pull the eye lens. The eye lens becomes thin and its converging power becomes small. The small converging power is sufficient to converge the parallel light rays from the distant object to form an image on the retina. (b) When the eye is focussing on a nearby object, it is said to be accommodated. The ciliary muscles contract, because of which they cannot pull the suspensory ligaments tightly. As the suspensory ligaments are loose, they stop pulling the eye lens, because of which the eye lens bulges or becomes thick. The thick eye lens has greater converging power, which helps in converging the diverging light rays from the nearby object to form an image on the retina. (a) Where are they found? (b) What is each type called? (c) To what is each type of cell sensitive? There are two types of light-sensitive cells in the human eye. (a) They are found in the retina. (b) They are called rods and cones. (c) The rods (rod-shaped cells) present in the retina are sensitive to dim light and are responsible for vision in dim light. The cones (cone-shaped cells) present in the retina are sensitive to bright or normal light and are responsible for colour discrimination and colour vision. Rods and cones are the light-sensitive cells in the retina of the eye. Rods (rod-shaped cells) present in the retina are sensitive to dim light and are vital for vision at night. Humans have a very small number of rod cells in their retina compared with nocturnal animals, such as owls, which have a relatively large number of rod cells in their retina. Hence, human vision is relatively poor compared with the vision of owls, which can see objects at night. (a) How does the convex eye-lens differ from the ordinary convex lens made of glass? (b) List, in order, the parts of the eye through which light passes to reach the retina. (a) The focal length of the convex eye lens and its converging power can be changed by the action of the ciliary muscles, whereas the focal length of a convex lens made of glass cannot be changed. Finally, from the vitreous humour, light reaches the retina, which has light-sensitive cells. (a) What happens to the size of pupil of our eye (i) in dim light (ii) in bright light? (b) Name the cells on the retina of an eye which are sensitive to (i) bright light (ii) dim light (iii) sensation of colour. (a) Draw a simple diagram of the human eye and label clearly the cornea, iris, pupil, ciliary muscles, eye-lens, retina, optic nerve and blind spot. (b) Describe the working of the human eye with the help of the above diagram. (c) How does the eye adjust itself to deal with light of varying intensity? The light from an object enters the eye through the cornea, a transparent substance. Behind the cornea, there is the iris, a ring-shaped membrane that has a hole in the middle called the pupil. The light passes through the pupil and falls on the eye lens, which is a convex lens made of a transparent, jelly-type material. 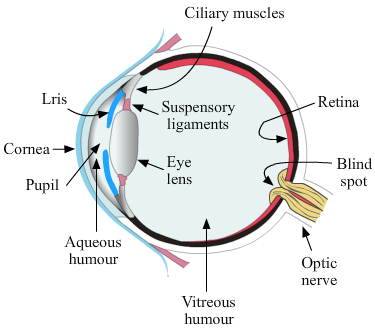 Suspensory ligaments are attached to the eye lens on one end and to the ciliary muscles on the other end. The eye lens converges the light rays to form a real and inverted image of the object on the retina with the help of light-sensitive cells and generates electric signals. The signals are conveyed to the brain through the optic nerve, which then gives rise to the sensation of vision. There are no visual receptors at the junction of the optic nerve and the retina. This point is called the blind spot. The space between the eye lens and the retina is filled with a transparent, jelly-like substance called vitreous humour, which supports the back of the eye. (c) The iris regulates the amount of light entering the human eye by automatically adjusting the size of the pupil according to the intensity of light that the eye receives. If the intensity of light is high, the iris contracts the pupil so as to reduce the amount of light entering the eye. If the intensity of light is low, the pupil expands to allow more light to enter the eye. (b) If you walk from a dark room into sunlight and back again into dark room, how would your pupils alter in size? What makes this happen? (c) Explain why, we cannot see our seats first when we enter a darkened cinema hall from bright light but gradually they become visible. (i) Cornea: The front part of the eye that is made of a transparent substance and is convex in shape is called the cornea. The light from an object enters the eye through the cornea. (ii) Iris: The iris is a flat, coloured and a ring-shaped membrane with a hole in the middle called the pupil. The iris regulates and controls the amount of light entering the eye by automatically adjusting the size of the pupil according to the intensity of light that the eye receives. (iii) Pupil: The pupil is a hole in the middle of the iris and appears black because there is no light reflected from it. The pupil expands or contracts to regulate the amount of light entering the eye. (iv) Ciliary muscles: The ciliary muscles contract or relax the eye lens and help in changing its focal length to focus the images of nearby or distant objects on the retina. (v) Eye lens: The eye lens is a convex lens whose main function is to the converge the light rays from an object and form a real and inverted image of the object on the retina. (b) Initially, in a dark room, the pupil is large so as to allow a large amount of light into the eye. When we go out into sunlight, we feel glare in our eyes as the pupil is large. Gradually, the pupil contracts, and we are able to see clearly. On moving back from sunlight to a dark room again, we are not able to see the surroundings clearly, because the pupil is small. Gradually, the pupil expands, which then improves our vision. This action of the pupil is controlled by the iris, which automatically adjusts the size of the pupil according to the intensity of light that the eye receives. (c) When we enter a darkened cinema hall from bright light, the pupil is small. As very little light enters the eye, we cannot see our seats clearly. Gradually, the size of the pupil expands, allowing more light to enter the eye, which then enables us to find our seats. The human eye forms the image of an object on its retina. The ciliary muscles change the focal length of the eye lens by changing its shape. The least distance for distant vision for a young adult with normal vision is 25 cm. The refraction of light in the eye occurs at both the cornea and the lens. The thickness of the eye lens is increased to focus the image of a nearby object on the retina of the eye. The term 'accommodation' as applied to the eye refers to its ability to vary the focal length of the lens. The iris controls the amount of light entering the eye. The human eye possesses the power of accommodation to focus on objects at different distances. (c) The lens becomes thicker or thinner. The eye lens becomes thicker to focus on nearby objects and thinner to focus on distant objects. The pupil becomes larger when you walk out of bright sunshine into a poorly lit room, to allow more light to enter the eye. (a) when you look at your hand? (b) when you look at a distant tree? (a) When we look at our hand, the eye lens is thick. When we look at a nearby object, the eye lens becomes thick or more convex to converge the rays of light from the nearby object (our hand) to form an image on the retina. (b) When we look at a distant tree, the eye lens is thin. When we look at a far-off object, the eye is in a relaxed state. The eye lens becomes thin or less convex because a small converging power of the eye lens is sufficient to focus the parallel light rays from the distant object (the tree) to form an image on the retina. The iris controls the amount of light entering the human eye by automatically adjusting the size of the pupil according to the intensity of light received by the eye. If the intensity of light is greater, the iris helps in contracting the pupil to accommodate the right amount of light inside the eye, thus protecting the retina from being damaged by bright light. (a) Which parts of the eye cause rays of light to converge on the retina? (b) Which part causes the greatest convergence? (c) Which part brings the image into sharp focus on the retina? How does it do this? (a) The cornea and the eye lens are the parts of the eye that cause rays of light to converge on the retina. (b) The cornea is the part of the eye that causes the greatest convergence because light first enters the eye through the cornea, which is convex. (c) The eye lens is the part of the eye that brings images into sharp focus on the retina. The eye lens changes its thickness and converging power to focus the images of nearby and distant objects on the retina. When an object is moved closer to the eye, the ciliary muscles in the eye contract. When the ciliary muscles contract, the suspensory ligaments attached to them are loosened, because of which they stop pulling the eye lens. 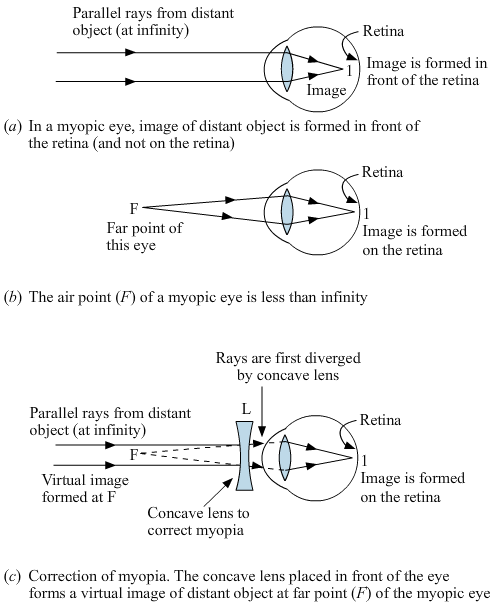 As a result, the eye lens becomes thick and its converging power increases. The greater converging power enables the eye to focus the diverging rays from the nearby object and form a clear image on the retina. The eye lens does not have to do all the work of converging incoming light rays because the cornea, which is in the front of the eye, also converges the rays of light entering the eye. When it gets dark at night, the level of light is too low for the cone cells, which are responsible for colour perception, to function efficiently. This makes it difficult to see the colours of cars on the road. Nocturnal animals, such as owls, tend to have wide pupils and several rod cells in their retina because wide pupil allow more light to enter the eyes and the rods cells in the retina are sensitive to dim light and are vital for night vision. The two most common defects of vision (or defects of the eye) are the following. 1. Myopia (short-sightedness or near-sightedness): Myopia is an eye defect because of which a person cannot see faraway objects clearly but can see nearby objects normally. By using spectacles with concave lenses, myopia can be corrected, as a concave lens reduces the converging power of the eye lens and therefore forms the images of faraway objects on the retina of the myopic eye. 2. Hypermetropia (long-sightedness or far-sightedness): Hypermetropia is an eye defect because of which a person cannot see nearby objects clearly but can see faraway objects normally. By using spectacles with convex lenses, hypermetropia can be corrected, as a convex lens increases the converging power of the eye lens and therefore forms the images of nearby objects on the retina of the hypermetropic eye. 1. A defect of vision because of which a person cannot see distant objects clearly. A defect of vision because of which a person cannot see nearby objects clearly. 2. The far point of a myopic eye is closer than infinity. The near point of a hypermetropic eye is more than 25 cm away. 3. Myopia occurs because the eye lens has a high converging power or because the eye ball is too long. Hypermetropia occurs because the eye lens has a low converging power or because the eye ball is too short. 4. A person suffering from myopia should wear spectacles with concave lenses as a concave lens decreases the converging power of the eye lens and therefore helps in forming the images of faraway objects on the retina of the myopic eye. A person suffering from hypermetropia should wear spectacles with convex lenses as a convex lens increases the converging power of the eye lens and therefore helps in forming the images of nearby objects on the retina of the hypermetropic eye. Hypermetropia (long-sightedness) is a defect of vision that can be corrected by using converging lenses. The following ray diagram shows the correction of hypermetropia using a convex lens. A person with hypermetropia cannot see nearby objects clearly but can see distant objects normally. Fig. (a) shows the near point of the hypermetropic eye, and fig. (b) shows the rays of light from a nearby object forming a blurred image, as the image is formed at a point behind the retina. To correct this defect, convex lenses are used in spectacles, because of which, as illustrated in fig. (c), the rays of light from the nearby object are converged to form a clear and sharp image of the object on the retina. Myopia is one of the common defects of vision because of which a person is able to see nearby objects, but not distant objects, clearly. Concave lenses are used to correct this defect. (a) whose near point is more than 25 on away. (a) Hypermetropia is the defect of vision in a person whose near point is more than 25 cm away. (b) Myopia is the defect of vision in a person whose far point is located closer than infinity. (a) by using a concave lens? (b) by using a convex lens? (a) Myopia can be rectified by using concave lenses. (b) Hypermetropia can be rectified by using convex lenses. What type of lens is used to correct (a) hypermetropia (b) myopia? (a) Convex lenses are used to correct hypermetropia. (b) Concave lenses are used to correct myopia. What is the other name for (a) myopia (b) hypermetropia? a) The other name of myopia is short-sightedness. b) The other name of hypermetropia is long-sightedness. What is the scientific name of (a) short-sightedness, and (b) long-sightedness? (a) Myopia is the scientific name of short-sightedness. (b) Hypermetropia is the scientific name of long-sightedness. What kind of lens is used to correct (a) short-sightedness (b) long-sightedness? (a) Concave lenses are used to correct short-sightedness. (b) Convex lenses are used to correct long-sightedness. Short-sightedness can be corrected by using concave lenses. Presbyopia is the defect of vision because of which the eye lens loses its power of accommodation because of old age. Cataract is the defect of vision that makes the eye lens cloudy, causing blurred vision. Presbyopia is the other name of old-age hypermetropia. Myopia and hypermetropia are two defects of vision that can be corrected by using spectacles. Cataract is a defect of vision that cannot be corrected by any type of spectacle lenses. The eye is the body part with which the terms 'myopia' and 'hypermetropia' are connected. The far point of a person suffering from myopia is located closer than infinity. The near point of a person suffering from hypermetropia is more than 25 centimetres away. (a) Is she short-sighted or long-sighted? (b) What type of lenses-converging or diverging-would an optician prescribe for her? (b) An optician would prescribe diverging lenses to correct her defect. (a) From which defect of the eye is he suffering? (b) What type of spectacle lens should he use to correct the defect? (a) The man is suffering from hypermetropia (long-sightedness). (b) To correct his defect of vision, he should use convex lenses in his spectacles. (a) Name the type of defect he is suffering from. (b) How can this defect by corrected? (b) To correct his defect, he should use concave lenses in his spectacles. (a) A short-sighted person cannot see ............ objects clearly. Short-sightedness can be corrected by using ........... lenses. (b) A long-sighted person cannot see ........... objects clearly. Long-sightedness can be corrected by using .............. lenses. (a) A short-sighted person cannot see distant objects clearly. Short-sightedness can be corrected by using concave lenses. (b) A long-sighted person cannot see nearby objects clearly. Long-sightedness can be corrected by using convex lenses. Myopia (short-sightedness) is a defect of vision that can be corrected by using diverging or concave lenses. The following ray diagram clearly shows the correction of myopia by using a diverging lens. A person with myopia does not see distant objects clearly but has normal near vision. Fig. (a) shows the far point of the myopic eye, and fig. (b) shows the parallel light rays from a distant object forming an image at a point in front of the retina. To correct this defect, a concave lens is used, because of which, in fig. (c), we observe the rays being diverged first so that they form a clear image on the retina. Myopia is a defect of vision because of which a person is unable to see distant objects clearly but has normal near vision. Myopia occurs because the converging power of the eye lens is greater than normal and the images of distant objects are formed in front of the retina. As a result, a person with myopia cannot see these objects clearly. In certain other cases, myopia occurs because the eyeball is too long and the distance of the retina from the eye lens is large. This, too, causes the formation of images in front of the retina. The far point of a myopic eye is closer than infinity. The following ray diagram explains the myopic eye and how the defect can be corrected by using concave lenses. A concave lens diverges the light rays from distant objects to form virtual images of the objects at the far point of eye. The eye lens then easily focusses the light rays from the far point to form clear images on the retina. Hypermetropia is a defect of vision because of which a person cannot see nearby objects clearly but has normal distant vision. Hypermetropia occurs because the converging power of the eye lens is low and the images of nearby objects are formed behind the retina. As a result, the person cannot see these objects clearly. In certain other cases, hypermetropia is caused because the eye ball is too short. This, too, causes the formation of images behind the retina, as the retina is at a smaller distance from the eye lens. The near point of a hypermetropic eye is located more than 25 centimetres from the eye. The following ray diagram explains the hypermetropic eye and how the defect is corrected by using convex lenses. A convex lens is a converging lens that converges light rays and forms virtual images of nearby objects at the eye's near point. The eye lens then easily focusses the light rays from the near point and forms clear images of the objects on the retina. A person suffering from myopia can correct the defect by wearing spectacles with concave lenses. In order to find the power of the concave lens required, we have to first calculate its focal length. Given that the far point of the myopic person is 2 m from the eye (the person can see an object kept at infinity if the image of the object is formed at the far point of 2 m from the eye). The focal length can be calculated using the lens formula 1v-1u=1f. Substituting the values in the formula, we get 1-2-1∞=1f. Now that we know the focal length of the concave lens, the power can be calculated. Therefore, the power of the concave lens required to rectify the defect is -0.5 dioptres. A person suffering from hypermetropia can correct the defect by wearing spectacles with convex lenses. In order to find the power of the convex lens required, we have to first calculate its focal length. Given that the near point of the hypermetropic eye is 50 cm in front of the eye (the person can see an object kept at the normal near point of 25 cm from the eye if the image of the object is formed at the person's own near point of 50 cm from the eye). Substituting the values in the formula, we get 1-50-1-25=1f. Now that we know the focal length of the convex lens, the power can be calculated. Hence, the power of the convex lens required to rectify this defect is +2 dioptres. A person needs a lens of power, − 5.5 dioptres for correcting his distant vision. For correcting his near vision, he needs a lens of power, +1.5 dioptres. What is the focal length of the lens required for correcting (i) distant vision, and (ii) near vision? In order to correct distant vision, a person wears spectacles with concave lenses. Given that the power of the concave lens required to correct the distant vision of the person, P = -5.5 D.
The focal length of the concave lens required for correcting the defect is given by f=1p. Hence, the focal length of the concave lens required to correct the person's distant vision is -18.18 cm. (b) In order to correct near vision, a person wears spectacles with convex lenses. 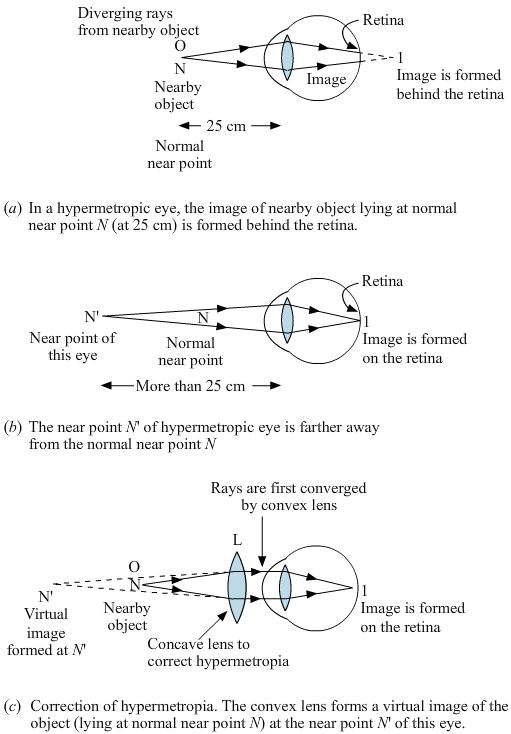 Given that the power of the convex lens, P = +1.5 D.
The focal length of the convex lens required for correcting this defect is given by f=1p. Hence, the focal length of the convex lens required to correct his near vision is +66.6 cm. Presbyopia is a defect of the eye because of which a person cannot see nearby objects clearly. This defect occurs because of the loss of the power of accommodation of the eye. Presbyopia usually occurs in old age. The two causes of this defect are as follows. 1. Weakening of the ciliary muscles in old age. 2. Reduction in the flexibility of the eye lens. Presbyopia, which is a special kind of hypermetropia, can be corrected by using spectacles with convex lenses. A person is said to have developed cataract when the eye lens becomes cloudy or opaque because of the formation of a membrane over the lens. This causes blurred vision and might eventually lead to complete loss of vision. Cataract is a medical condition that usually occurs in old age and cannot be corrected by any type of spectacle lenses. However, the vision of a person with cataract can be restored surgically by replacing the opaque lens in the eye with an artificial lens. A person is short-sighted if his eyeball is too long. Spectacles with a concave lens are needed. A person is long-sighted if his eyeball is too short. Spectacles with a convex lens are needed. These focus light rays exactly on to the retina. (b) A person having short-sight cannot see objects clearly beyond a distance of 1.5 m. What would be the nature and power of the corrective lens to restore proper vision? (a) Short-sightedness, or near-sightedness, is an eye defect because of which a person cannot see distant objects clearly but has normal near vision. Short-sightedness occurs because of the high converging power of the eye lens (images are formed in front of the retina) and because the eyeball is too long (images are formed in front of the retina). 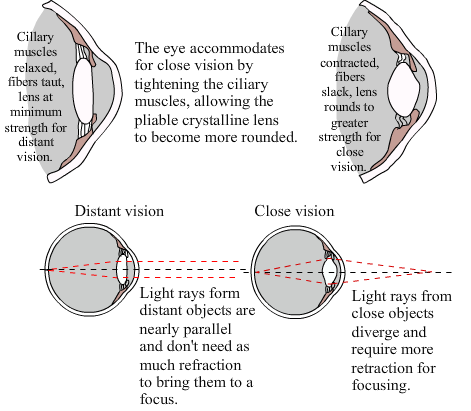 (i) and (ii) The following diagram illustrates short-sightedness and how concave lenses can correct the defect by diverging the light rays entering the eye to form clear images of distant objects on the retina. (b) A person suffering from short-sightedness can correct the defect by wearing spectacles fitted with concave lens. In order to find the power of the concave lens, we have to first calculate its focal length. Given, the far point of the short-sighted person is 1.5 m from the eye (the person can see the object kept at infinity if the image of the object is formed at the person's own far point of 1.5 m from the eye). The focal length can be calculated using the lens formula 1f=1v-1u. Now, that we know the focal length of the concave lens, its power can be calculated. Hence, the power of the concave lens required to rectify the defect is -0.67 D.
(b) An eye has a near point distance of 0.75 m. What sort of lens in spectacles would be needed to reduce the near point distance to 0.25 m? Also calculate the power of lens required. Is this eye long-sighted or short-sighted? (c) An eye has a far point of 2 m. What type of lens in spectacles would be needed to increase the far point to infinity? Also calculate the power of lens required. Is this eye long-sighted or short-sighted? The ray diagram shows the hypermetropic eye and how the defect is corrected by using a convex lens, which converges the light rays from objects and forms clear images on the retina. (b) A person suffering from hypermetropia can correct the defect by wearing spectacles containing convex lenses. In order to find the power of the convex lens required, we have to first calculate its focal length. Given that the near point of the hypermetropic person is 0.75 m from the eye (the person can see objects kept at the normal near point of 0.25 m in front of the eye if the images of the objects are formed at the person's own near point of 0.75 m from the eye). Now that we know the focal length of the convex lens, its power can be calculated. Hence, the power of the convex lens required to rectify the defect is +0.37 D.
(c) The far point of an eye can be increased by wearing spectacles with concave lens. In order to find the power of the concave lens required, we have to first calculate its focal length. Given that the far point of the short-sighted person is 2 m in front of the eye (the person can see objects kept at infinity if the images of the objects are formed at the person's own far point of 2 m from the eye). Substituting the values in the formula, we get 1f=1-2-1∞=-12 (Since, 1∞=0). Now that we know the focal length of the concave lens required, its power can be calculated. Hence, the power of the concave lens required to rectify the defect is -0.5 D.
Cataract is the defect of vision that cannot be corrected by using spectacles. It requires surgical intervention. Myopia is a defect of vision because of which a person cannot see distant objects clearly but can see nearby objects distinctly. As the woman can see distant objects clearly, but not nearby objects, she is suffering from the defect of vision called long sight. Hypermetropia is the defect of vision the young man is suffering from, because of which he finds it difficult to see nearby objects. The optician has prescribed convex lenses for the child's spectacles, because a convex lens is used to increase the converging power of the eye lens. This shows that the child is suffering from the defect of vision called long-sightedness. The optician has prescribed concave lenses for the person's spectacles, as a concave lens decreases the converging power of the eye lens. This shows that the person is suffering from short-sightedness, or myopia. As the far point of the eye is closer to him than normal, he can see nearby objects, but not distant objects, clearly. (a) The near point of his eyes has receded. If a man driving a car can see a distant road sign distinctly but cannot read the odometer on the dashboard of the car clearly, it suggests that the near point of his eyes has receded. Cataract is the defect of vision because of which the eye lens gets progressively cloudy, resulting in blurred vision. Concave lenses are used to correct the defect of vision and enable the person to see distant objects clearly. Converging lenses are used to correct the defect of vision and enable the person to see nearby objects clearly. (a) If the victim's spectacles are fitted with convex lens, the detective can conclude that the victim was long-sighted. A person suffering from long-sightedness, or hypermetropia, wears spectacles with convex lenses to correct the defect. (b) If the victim's spectacles are fitted with concave lens, the detective can conclude that the victim was short-sighted. A person with short-sightedness, or myopia, wears spectacles with concave lenses to correct the defect. As the person is wearing half-moon spectacles, he should be suffering from the eye defect called long-sightedness, or hypermetropia, because his spectacles are fitted with convex lens. The convex lenses form the images of nearby objects at the near point of his eye, and he can, therefore, see these objects clearly. (a) (i) A short-sighted person with a near point of 15 cm and a far point of 40 cm in front of the eye cannot clearly see an object at a distance of 5 cm because he can see an object only when it is placed at his near point (i.e., 15 cm). (b) A short-sighted person can clearly see an object at a distance of 25 cm as it the normal near point of the eye. Moreover, the person's far point is located at 40 cm from the eye. (c) The person cannot see the object clearly as it is at a distance of 50 cm, which is beyond his far point. (d) In order to see an object clearly at infinity, the person should use concave lenses in his spectacles. A concave lens first diverges the light rays from the object at infinity to form a virtual image at the eye's far point. The eye lens then easily focusses the rays from the eye's far point to form a clear image on the retina. (b) To read a book held at a distance of 25 cm, will she need converging or diverging spectacle lenses? (a) (i) A long-sighted person who has a near point of 50 cm from the eye cannot clearly see an object kept at a distance of 20 cm. She can see an object only if it is kept at her near point of 50 cm in front of the eye. (ii) As the person is long-sighted, she cannot see nearby objects, but can see distant objects, clearly. Therefore, she can clearly see the object kept at infinity. (b) To read a book held at a distance of 25 cm, the person, who is long-sighted, will need converging lenses. (a) If the person is an old man, then the defect of vision is presbyopia. It usually occurs in old age when a person cannot see nearby objects clearly because of the loss of the eye's power of accommodation. (b) If the person is a young man, the defect of vision is hypermetropia. Hypermetropia occurs either because the eye lens has low converging power or because the eyeball is too short. This makes the near vision defective. (a) with one eye open? (b) with both eyes open? (a) Our field of view with one eye open is about 150o. (b) Our field of view with both eyes open is 180o​. (a) Animals that have two eyes on the opposite sides of their head have a wider field of view. (i) at the front of their head? (ii) on the opposite sides of their head? (i) Predators have their eyes in the front of their head. (ii) Animals of prey have their eyes on the opposite sides of their head as this gives them a wider view that helps them to be alert. True. A rabbit has eyes that face sideways. The following are the advantages of having two eyes. 1. Having two eyes instead of one gives us a wider field of view. With one eye, our field of view is only about 150o, but with two eyes, our field of view increases to 180o. 2. Having two eyes instead of one gives us an accurate judgement of the distance of an object. As our eyes are a few centimetres apart from each other, each eye focusses on the same object at different angles and sends two slightly different images to the brain. The job of the brain is to combine these two images and form an accurate three-dimensional image of the object. A person who has lost sight in one eye is at a disadvantage for the following reasons. (i) The person's field of view decreases. Having two eyes enables a person to see a larger area around him or her. With only one eye, the field of view becomes limited to only about 150o. (ii) The person's ability to accurately judge the distances of objects decreases. In the case of a person with two good eyes, both the eyes would focus on the same object at different angles and send two images to the brain that slightly differ from each other. The brain then combines the two images to form a three-dimensional image of the object, which helps the person to judge the distance of the object accurately. With one eye, it becomes difficult to judge the distance accurately. (a) one the sides of the head. (b) at the front of the head. (a) Animals of prey, such as rabbits and deer, have eyes on the sides of the head so that they can see their enemies and become alert. (b) Predators, such as lions and tigers, have eyes in the front of the head, which enables them to judge the distance of their prey accurately. Predators, such as lions, have their eyes facing forward in the front of their heads because this enables them to judge the distance of their prey accurately and catch them easily. Animals of prey, such as rabbits, usually have eyes on the sides of their head because this enables them to view a larger area. They can, therefore, see potential predators in a large area around them and try to escape. (a) Which of these persons can donate eyes? (b) Which of these persons cannot donate eyes? (a) Person with asthma (C) can donate his eyes. (b) Persons with diabetes (A), leukaemia (B), meningitis (D) or hepatitis (E) cannot donate their eyes. Meningitis and hepatitis are infectious diseases whereas leukaemia is a type of blood cancer and is communicable. Diabetic patients also cannot donate their eyes. A lion does not have eyes that face sideways. A person's field of view with both eyes open is about 180o. Having two eyes gives a person a wider field of view. Animals of prey have two eyes on the sides of their head. This gives them a wide field of view and allows them to see the approach of potential predators. Predators have both the eyes at the front of their heads so that they can judge the distance of their prey accurately. (a) Having two eyes gives a ................field of view. (b) Having two eyes enables us to judge.................more accurately. (a) Having two eyes gives a wider field of view. (b) Having two eyes enables us to judge distances more accurately. 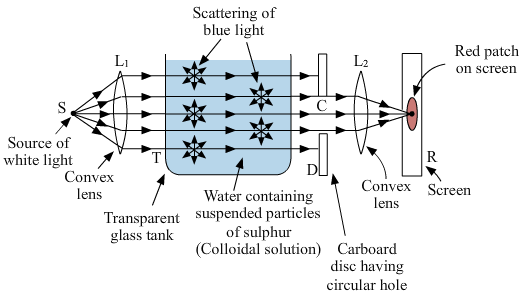 (i) The splitting of white light into its component colours on passing through a glass prism is shown in the following diagram. (ii) The least deviated colour is red, which is marked in the diagram. (iii) Different colours have different wavelengths; therefore, they deviate differently when passing through a glass prism. The amount of deviation depends on the wavelength of the coloured light. As light rays pass from the air into a glass prism, they are refracted towards the normal because glass is denser than air. As light rays emerge from a glass prism into the air, they are refracted away from the normal. A rainbow is a natural phenomenon caused by the dispersion of sunlight in the sky. The formation of a rainbow in the sky shows that sunlight is a combination of seven colours. Newton demonstrated the phenomenon of dispersion of light by his experiments with the prism. He showed that white sunlight is in fact composed of seven colours: violet, indigo, blue, green, yellow, orange and red. The seven colours that make up white light are red, orange, yellow, green, blue, indigo and violet. The seven colours of the spectrum of white light is denoted by the term 'VIBGYOR', in which 'V' stands for violet, 'I' for indigo, 'B' for blue, 'G' for green, 'Y' for yellow, 'O' for orange and 'R' for red. The spectrum of light is connected with the phenomenon of dispersion of light. (i) which colour is deviated least? (ii) which colour is deviated most? Blue and yellow are the colours that lie on the two sides of the colour green in the spectrum of white light. Sir Isaac Newton discovered that sunlight consists of seven colours. The order of colours in a rainbow from the outside to the inside is as follows: red, orange, yellow, green, blue, indigo and violet. 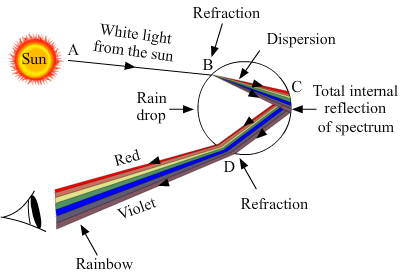 Which colour of the spectrum has (a) longest wavelength, and (b) shortest wavelength? (a) The colour red of the spectrum has the longest wavelength. (b) The colour violet of the spectrum has the shortest wavelength. Red light has the longest wavelength among all the colours in the visible spectrum. Violet light has the shortest wavelength in the spectrum of colours. (a) When a ray of light enters a prism, it bends ................ the normal ; as it leaves the prism, it bends ................. the normal. (a) When a ray of light enters a prism, it bends towards the normal; as it leaves the prism, it bends away from the normal. (b) White light is composed of seven colours. The colour of white light deviated through the largest angle by a prism is violet. (a) What happens when a ray of ordinary light is passed through a triangular glass prism? (b) What will happen if another similar glass prism is placed upside down behind the first prism? (a) When a ray of ordinary light is passed through a triangular glass prism, the light splits into a spectrum of seven colours. This splitting of light into its constituent colours is called dispersion of light. The role of the prism is to separate the seven colours of the white light. (b) If a second, similar glass prism is placed upside down behind the first prism, recombination of seven colours takes place and a patch of ordinary white light is obtained on a screen placed behind the second prism. The recombination of colours took place because the second prism was placed upside down, because of which the refraction produced by the second prism was equal and opposite to the refraction produced by the first prism. When a beam of white light is passed through a prism, it splits to form lights of seven colours. It is possible to recombine the lights of seven colours to obtain white light again. Recombination of colours to form white light again is possible if a second glass prism is placed upside down behind the first prism. A patch of white light is obtained on a screen placed behind the second prism because the refraction produced by the second prism is equal and opposite to the refraction produced by the first prism. (a) What is spectrum? What is the name of glass shape used to produce a spectrum? (b) How many colours are there in a full spectrum of white light? Write the various colours of spectrum in the order, starting with red. (a) A spectrum is a band of seven colours produced when a beam of white light is passed through a transparent glass prism. To produce a spectrum of white light, a triangular glass prism is used. (b) There are seven colours in a full spectrum of white light. The various colours of a spectrum in their order, starting with red, are as follows. The splitting of white light into seven colours on passing through a transparent glass prism is called dispersion of white light. A rainbow is formed in the sky because of the dispersion of sunlight by millions of water droplets in the atmosphere. Every single water droplet behaves like a tiny glass prism that splits the white light into different colours. Different colours bend at different angles on passing through the water droplets, thus separating the white light into a natural spectrum of seven colours, namely, violet, indigo, blue, green, yellow, orange and red. The diagram presented supports the above explanation and gives a clear picture about the formation of a rainbow. (a) State the colour seen (i) at X, and (ii) at Y. (b) Why do different colours of white light bend through different angles with respect to the incident beam of light? (a) (i)The colour seen at X is violet (as it is the maximum deviated). (ii) The colour seen at Y is red (as it is the least deviated). (b) Different colours of white light bend at different angles with respect to the incident beam of light. This is because different colours have different wavelength. The diagram shows the dispersion of white light into a spectrum of colours by using a glass prism. The various colours of the spectrum are shown in the diagram. When we see a pool of water. The pool appears less deep as it is. This is due to the refraction of light. When white light is allowed to pass through the glass prism. It splits into seven colour this is called dispersion of light. We can show that white light is composed of a number of colours by passing it through a transparent glass prism. A glass prism is a triangular refracting surface. When a beam of white light enters the prism, the light splits, forming a band of seven colours on a screen placed on the other side of the prism. This splitting of light into its constituent colours is called dispersion of light. The formation of seven colours in a spectrum shows that white light is composed of these seven colours, namely, red, orange, yellow, green, blue, indigo and violet. We know that a spectrum of colours is formed when a beam of white light is passed through a transparent glass prism. These colours can be recombined to give white light again. This is achieved by placing another glass prism upside down behind the first prism. A patch of white light is obtained on a screen placed behind the second prism because the refraction produced by the second prism is equal and opposite to the refraction produced by the first prism. Violet light is refracted the most by a prism. When white light passes through a glass prism, violet colour has the minimum speed and a short wavelength. As violet has a short wavelength, it undergoes the maximum deviation and hence appears at the bottom of the spectrum. On the other hand, red light, which is also a part of the spectrum, has the maximum speed and a longer wavelength, and hence it is the least deviated and forms the upper part of the spectrum. (b) What is a rainbow? What are the two conditions necessary for the formation of a rainbow in the sky? (c) What acts as tiny prisms in the formation of a rainbow? (d) Name the process which is involved in the formation of a rainbow. (e) What are the seven colours seen in a rainbow? (b) A rainbow is a natural spectrum of seven colours formed in the sky when the water droplets in the atmosphere cause the dispersion of sunlight. The two conditions necessary for the formation of a rainbow are as follows. 1. The sun should be shining. 2. It should be raining. (c) Raindrops act as tiny prisms in the formation of a rainbow. (d) The dispersion of sunlight is the process that is involved in the formation of a rainbow. (e) The seven colours seen in a rainbow are red, orange, yellow, green, blue, indigo and violet. A beam of white light when shone on to a glass prism can be deviated, dispersed or refracted, but it cannot be focussed. The colour red undergoes the least bending on passing through the glass prism as it has longest wavelength. The colour violet of white light suffers the maximum refraction on passing through a glass prism as it has the shortest wavelength. Yellow is the colour of white light that is the least deviated by a prism because it has the largest wavelength of the colours given in the alternatives. Among the colours blue, indigo, red and orange, indigo is deviated the maximum on passing through a glass prism. The splitting of white light into seven colours on passing through a glass prism is called dispersion. The colour violet travels the slowest in a glass prism owing to its short wavelength. Yellow is the coloured light with the maximum speed in a glass prism as it has the greatest wavelength. Violet is the colour of white light that has the least wavelength. Of the given colours of light, orange has the maximum wavelength. When light passes through a flat pane of glass, the refracted light emerges out of the glass pane without any deviation because a glass pane has two sides that are parallel to each other. As the emergent light does not deviate from the original direction by any angle, we do not see the different colours of the light separated out in the form of a spectrum. 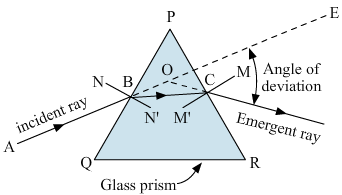 Therefore, in order to view a spectrum of colours, the incident rays have to fall on an object whose surfaces are not parallel, such as a glass prism (triangular shape). a) White objects, such as white chalk, white paper, snow, milk, white pearls and white clothes, reflect all the colours of sunlight and therefore appear white in colour. (b) Black objects, such as coal, blackboard, tar, ink, charcoal and black clothes, absorb all the colours of sunlight and therefore appear black in colour. A rainbow is nature’s example to show that sunlight is made up of different colours. A rainbow is formed in the sky because of the dispersion of sunlight by millions of water droplets in the atmosphere. Every single water droplet behaves like a tiny glass prism that splits the white light into different colours. Different colours bend at different angles on passing through the water droplets, thus separating the white light into a natural spectrum of seven colours, namely, violet, indigo, blue, green, yellow, orange and red. Stars seem higher than they actually are because of the phenomenon of atmospheric refraction. This can be understood with the help of given diagram. When the light from a star descends to the earth's surface, it passes through the different layers of the atmosphere. The atmospheric air at higher levels is rarer and the air near the earth's surface is denser, and the light from the star bends more sharply when it passes through the denser layer of air. Sunrise takes place when the sun is just above the horizon, but the atmospheric refraction of light makes the sun appear two minutes before sunrise. When the sun is slightly below the horizon, the sun's rays travel from the vacuum of space to the denser air of the earth's atmosphere. When sunlight passes from a rarer medium, namely, vacuum, to the denser medium of the air in the earth's atmosphere, it bends or refracts downwards. Owing to this refraction, the sun appears to be raised above the horizon even though it is slightly below the horizon. In the figure below, the actual position of the sun is just below the horizon, but it appears to be just above the horizon, owing to atmospheric refraction. As a result, the sun appears to rise two minutes before the actual sunrise. If we look at objects through the hot air over a fire, they appear to be moving or shaking slightly because of the refraction of light. When the air just above the fire gets heated up, it becomes optically rarer than the colder air further above the fire, which is optically denser. Now, when we look at objects over a fire, the light coming from them through two different mediums of different optical densities undergoes refraction, or bending of light, randomly, which makes the objects appear to be moving slightly. (a) What is atmospheric refraction? What causes atmospheric refraction? (b) Why do stars twinkle on a clear night? (c) Explain why, the planets do not twinkle at night. (a) The refraction of light caused by the earth's atmosphere is called atmospheric refraction. Atmospheric refraction is caused by the bending of light rays when they pass through the layers of the earth's atmosphere, which are of different optical densities. 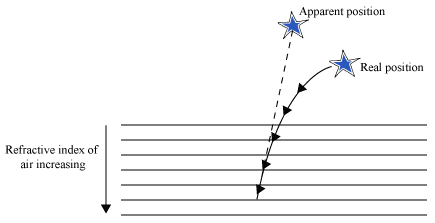 (b) Stars are self-luminous and far-off bodies. They twinkle as a result of the atmospheric refraction of their light. When the light of stars enters the earth's atmosphere, it refracts many times and in random directions because of the varying optical densities of the different air layers of the atmosphere. Because of this random refraction, stars appear to move slightly, and we interpret this phenomenon as twinkling. (c) The planets are large bodies and are very close to the earth. Therefore, the continuously changing atmosphere cannot cause much deviations in the light coming from the planets. The brightness of the planets remains the same, because of which they do not appear to twinkle at night. Atmospheric refraction is responsible for the twinkling of stars. Name the phenomenon which causes the twinkling of stars. (a) The twinkling of stars is produced by atmospheric refraction. (b) Advanced sunrise and delayed sunset are also effects produced by atmospheric refraction. (a) a few minutes before actual sunrise? (b) a few minutes after actual sunset? Atmospheric refraction is the phenomenon that enables us to see the sun (a) a few minutes before sunrise (advanced sunrise) and; (b) a few minutes after sunset (delayed sunset). (a) Sunrise is advanced by about two minutes. (b) Sunset is delayed by about two minutes. False. The planets do not twinkle at all because of the atmospheric refraction of light. As the planets are large bodies and very close to the earth, the continuously changing atmosphere cannot cause much deviations in the light coming from the planets. The brightness of the planets remains the same and they do not appear to twinkle. Stars seem higher in the sky than they actually are because of the phenomenon of atmospheric refraction. We can see the sun about two minutes before the actual sunrise and about two minutes after the actual sunset because of atmospheric refraction. The twinkling of stars is caused by the atmospheric refraction of light. The refraction of light changes the path of starlight, making stars appear higher in the sky than they actual are. Stars twinkle because they are far away. The planets do not twinkle at night because they are nearer to the earth. As the light from a far-off star comes towards the earth, it bends towards the normal because the air is denser closer to the surface of the earth. We can see the sun about two minutes before the actual sunrise. Because of the atmospheric refraction of sunlight, we can see the sun about two minutes before the actual sunrise and two minutes after the actual sunset. Therefore, the time from sunrise to sunset is lengthened by about four minutes (two minutes because of advanced sunrise and two minutes because of delayed sunset). The day is longer by about four minutes because the earth has an atmosphere. We know that light refracts when it travels from one medium to another. Though the earth's atmosphere contains only air, refraction takes place because the atmosphere consists of layers of air that are at different temperatures. The layers of air that are hotter behave like an optically rarer medium and those that are cooler behave like an optically denser medium. Therefore, when light travels through these layers of air of different optical densities, bending of light, or refraction, takes place. Atmospheric refraction causes the sun to appear two minutes before it is actually above the horizon (advanced sunrise). Also, we can see the sun for about two minutes even after it is actually below the horizon (delayed sunset). Therefore, the time from sunrise to sunset is increased by about four minutes because of the refraction of light through the earth's atmosphere. If the earth had no atmosphere, the length of the day would have been shorter by about four minutes. (a) What does the student mean by saying that the sun can be seen after it has set? (b) Do you think that the students conclusion is correct? a) The refraction of sunlight by the earth's atmosphere causes the sun to be seen for about two minutes even after it has set below the horizon. b) Yes, the student's conclusion about the longer duration of the day because of atmospheric refraction is correct. Atmospheric refraction causes the sun to appear two minutes before the actual sunrise and two minutes after sunset. Therefore, the time from sunrise to sunset is increased by about four minutes. Thus, the day gets longer by about four minutes than if the earth had no atmosphere. The phenomenon in which light gets scattered by the colloidal particles in its path, causing the path of light to be illuminated, is called the Tyndall effect. Example: The scattering of light can be observed when sunlight penetrates the canopy of a forest. The tiny water droplets present in the mist around the canopy scatter the sunlight in its path. This scattered light enters our eyes, enabling us to see the path of the sunlight. A beam of sunlight becomes visible when it enters a dusty room through a window. This is because the dust particles present in the air in the room scatter the light all around the room. This scattered light enters our eyes, enabling us to see the beam of sunlight. (a) scattered by the dust particles in the atmosphere? (b) scattered by the air molecules in the atmosphere? (a) The colour of sunlight scattered by the dust particles in the atmosphere is white. (b) The colour of sunlight scattered by the air molecules in the atmosphere is mainly blue. Light of shorter wavelengths gets scattered more easily. (a) The scattering away of red light makes the sky appear blue during the day time. (b) The scattering away of blue light makes the sun appear red at sunset. The scattering of colours of shorter wavelengths, such as blue, makes the sky appear blue during the daytime. The sky appears black to an astronaut, because there is no atmosphere in space to scatter the light from the sun. The Tyndall effect is illustrated by the observation that when a beam of sunlight enters a dusty room, its path becomes visible. The sky appears blue on a clear day because of the scattering of blue light by the air molecules in the earth's atmosphere. The air molecules are much smaller compared with the wavelength of visible light. Therefore, they scatter light of shorter wavelengths more easily and effectively than light of longer wavelengths. Hence, blue light gets scattered very easily because of its shorter wavelength compared with other colours, such as red, orange and yellow. The sky appears dark (or black) to an astronaut instead of blue because there is no atmosphere containing air molecules in outer space to scatter sunlight. Why does the sun appear red at sunrise? At sunrise, the sun is near the horizon; hence, sunlight has to travel a longer distance through the atmosphere to reach us. During this journey, most of the blue colour present in sunlight, which is of shorter wavelength, gets scattered from our line of sight. Thus, the red colour present in sunlight, which has a longer wavelength and is scattered the least, reaches our eye. As we see red light everywhere above, the sun and the surrounding sky appear red at sunrise. At sunset, the sun is near the horizon; hence, sunlight has to travel a longer distance through the atmosphere to reach us. During this journey, most of the blue colour present in sunlight, which has a shorter wavelength, gets scattered from our line of sight. Thus, the red colour present in sunlight, which has a longer wavelength and gets scattered the least, reaches our eye. As we see red colour everywhere overhead, the sun and the surrounding sky appear red at sunset. Danger signal lights are red because this colour has the longest wavelength among all the colours. Also, it is the least scattered by fog, dust and smoke particles. This makes red light visible even from a longer distance. (a) Draw a neat and labelled diagram of the experimental set up for observing the scattering of light in a colloidal solution of sulphur to show how the sky appears blue, and the sun appears red at sunrise and sunset. (b) Out of blue light and red light, which one is scattered more easily? (c) Which component of sunlight is scattered away when the sun appears red at sunrise or sunset? (d) What causes the scattering of blue component of sunlight in the atmosphere? (b) Blue light gets scattered more easily, because of its shorter wavelength. (c) The blue component of sunlight is scattered away when the sun appears red at sunrise or sunset. (d) The gas molecules present in the air cause the scattering of the blue component of sunlight in the atmosphere. The blue colour of the sky is due to the scattering of light by the air molecules in the atmosphere. The sun appears red at sunrise and sunset because the colour red is the least scattered. The sun appears red at sunset not because of the atmospheric refraction of light but because of the scattering effect of light. The sky appears blue because some of the blue component of sunlight is scattered by the gas molecules (nitrogen and oxygen) present in the air. The sun appears red at sunset because, at that time, the sun is near the horizon and, therefore, sunlight has to travel through a greater thickness of the earth's atmosphere. (a) Which colour is observed from the front of the glass tank? Does this colour correspond to the colour of sky on a clear day or the colour of sky around the sun at sunset? (b) Which colour is observed from the sides of the glass tank? Does this colour correspond to the colour of sky on a clear day or the colour of sky around the sun at sunset? a) The colour red of the beam of white light reaches a screen after passing through the colloidal sulphur solution in the transparent glass tank. Therefore, red colour is observed from the front of the glass tank. The colour red corresponds to the colour of the sky around the sun at sunset, because red colour is the least scattered and reaches our eye after the colour blue of white light gets scattered from our line of sight. b) Blue colour is observed from the sides of the glass tank. The colour blue corresponds to the colour of the sky on a clear day. This is because blue light is scattered easily by the gas molecules of the air in the atmosphere. This scattered light reaches our eyes, which makes the sky appear blue. When the sun is overhead at noon, sunlight has to travel a shorter distance through the earth's atmosphere to reach us. During this short journey of sunlight through the atmosphere, only a small amount of the blue light is scattered from the white light, keeping most of the white colour intact within it. However, at sunset or sunrise, the sun appears red because it is near the horizon, and sunlight has to travel a relatively longer distance through the earth's atmosphere to reach us. During this long journey, most of the blue colour is scattered from our line of sight. Therefore, the light reaching our eyes consists of the colour red of sunlight, which is of longer wavelength and is scattered the least. When the sun is setting, the light from it has to travel a greater thickness of the earth's atmosphere and only the longer wavelength red light is able to reach us. Sunset is therefore red in colour.